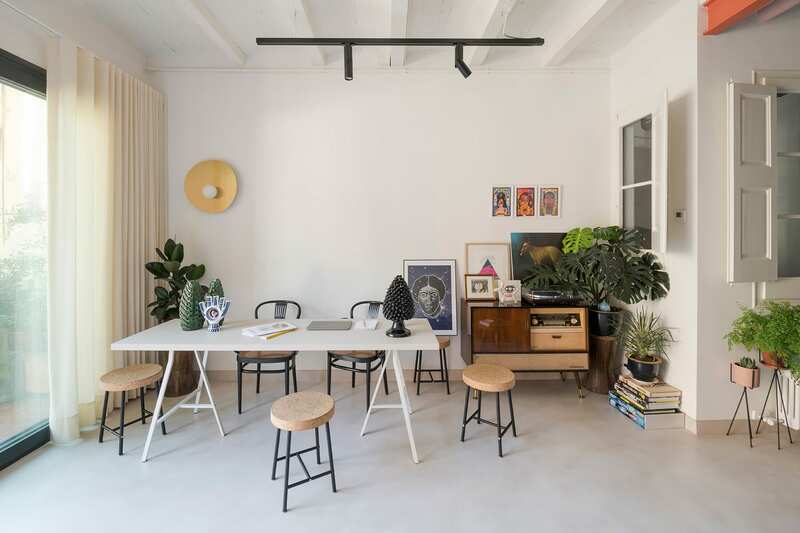 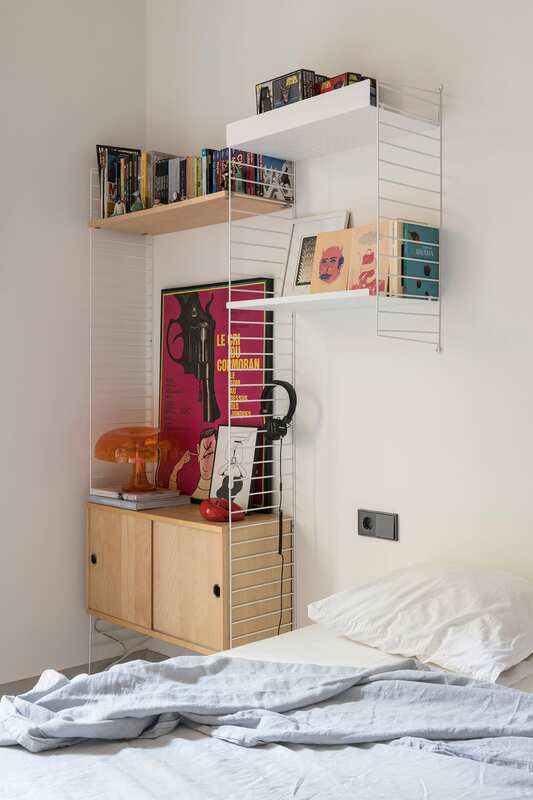 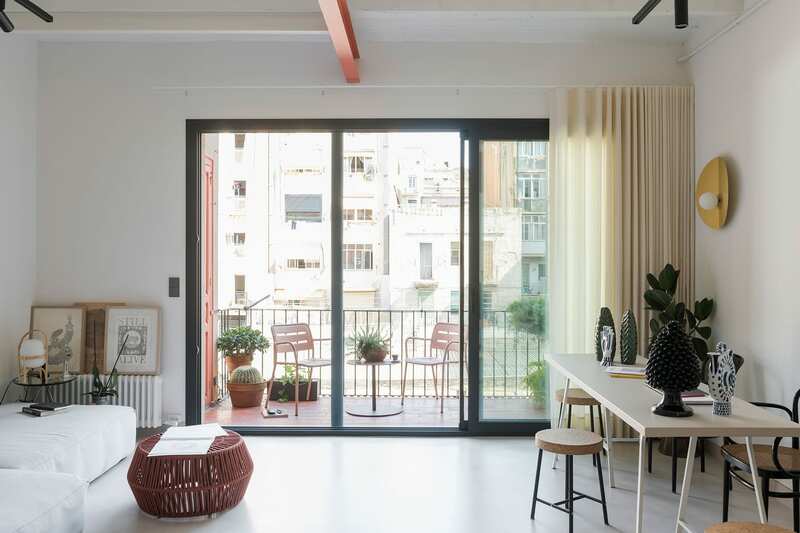 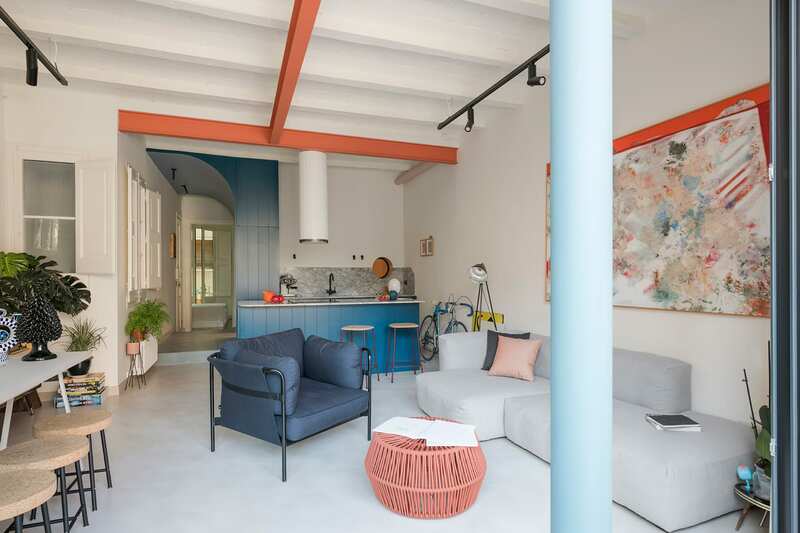 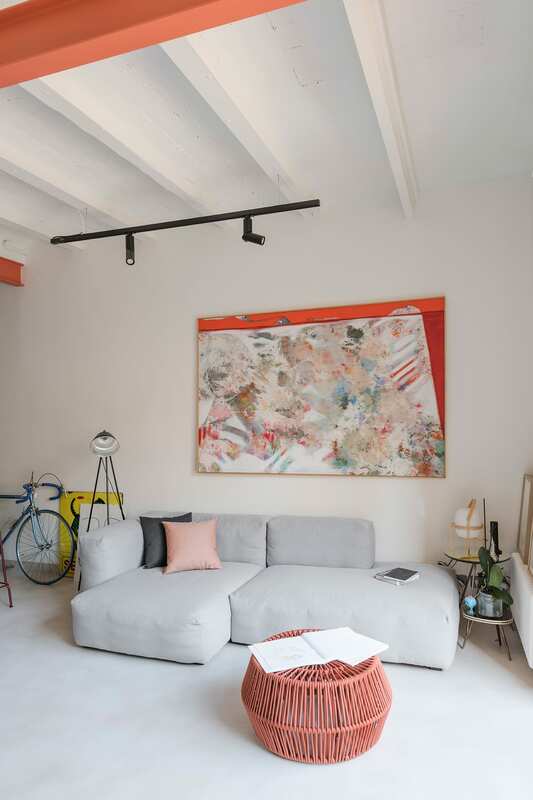 Font 6 Barcelona Apartment by Colombo and Serboli Architecture. 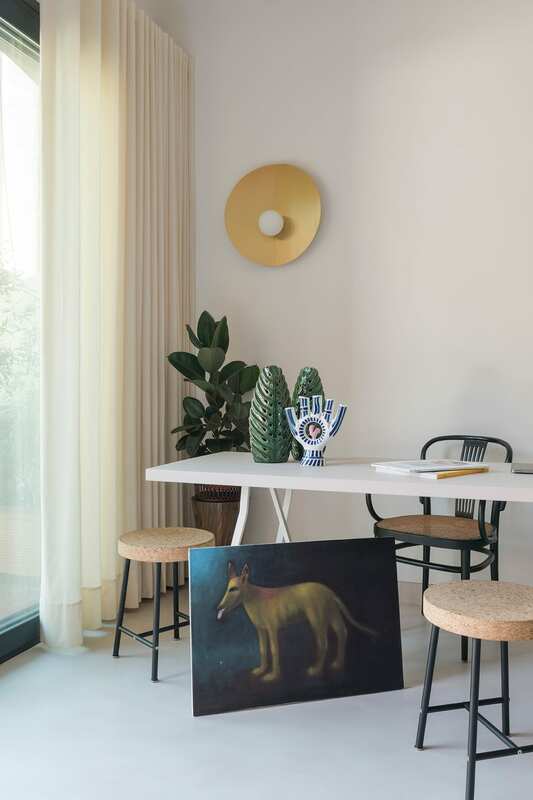 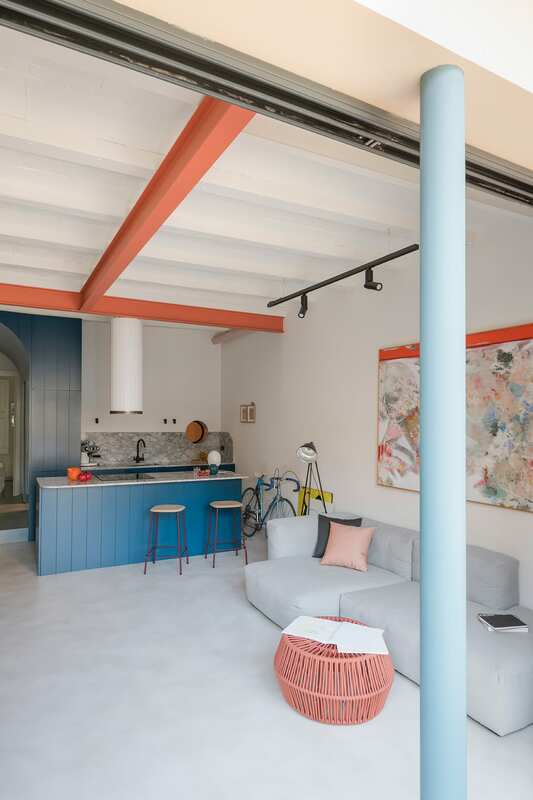 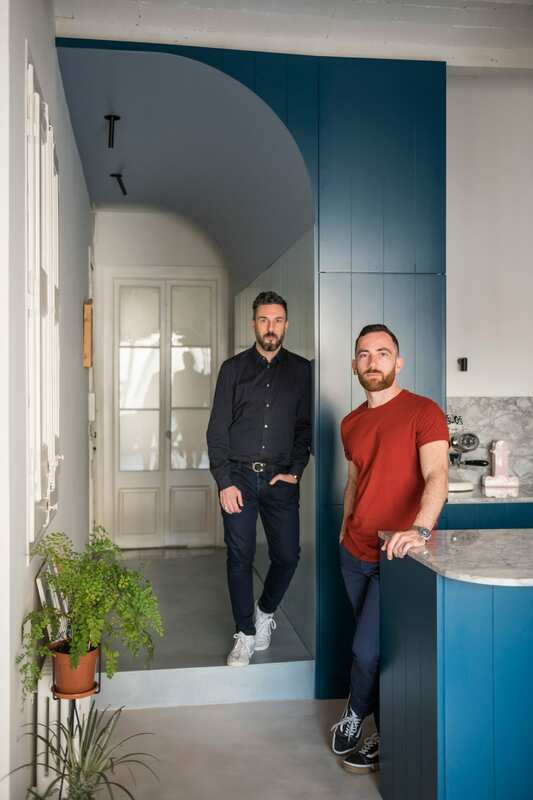 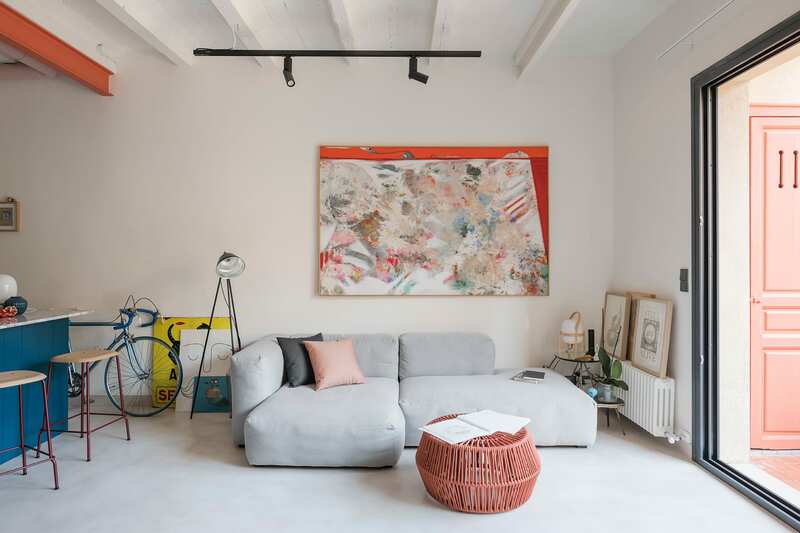 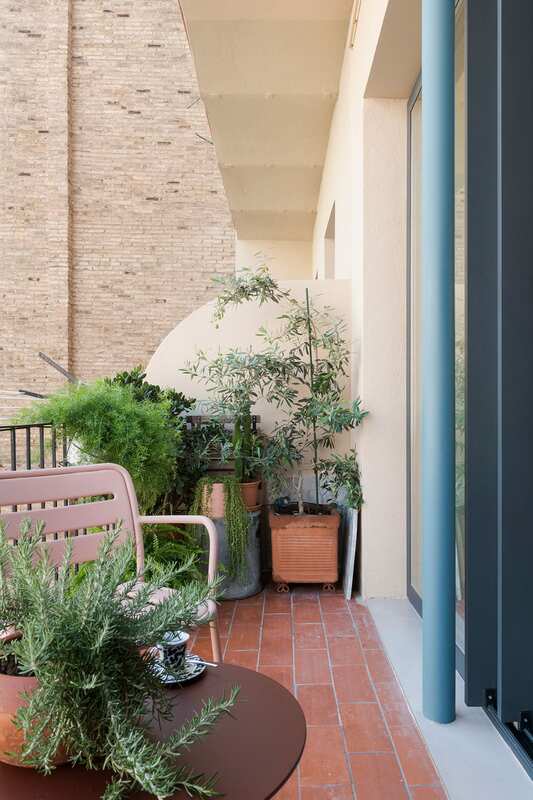 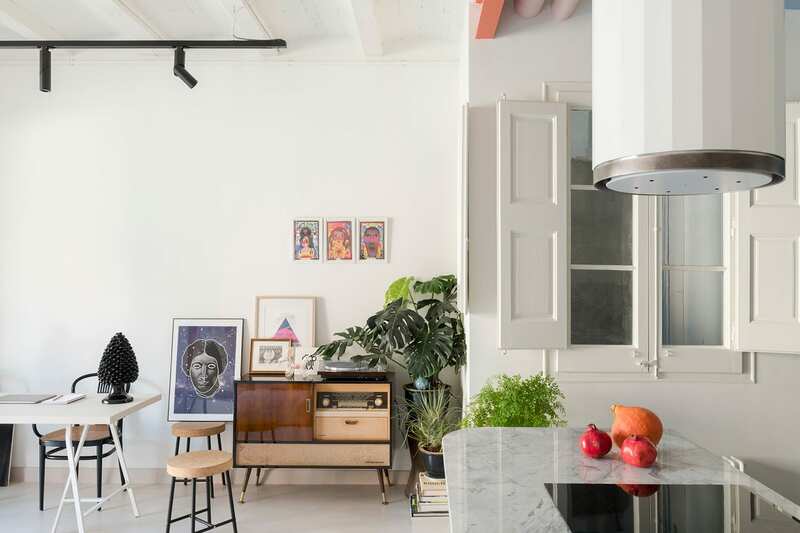 Andrea Serboli, the co-founder of Colombo and Serboli architecture, took his home renovation as an opportunity to develop a sample of the design firm’s style. 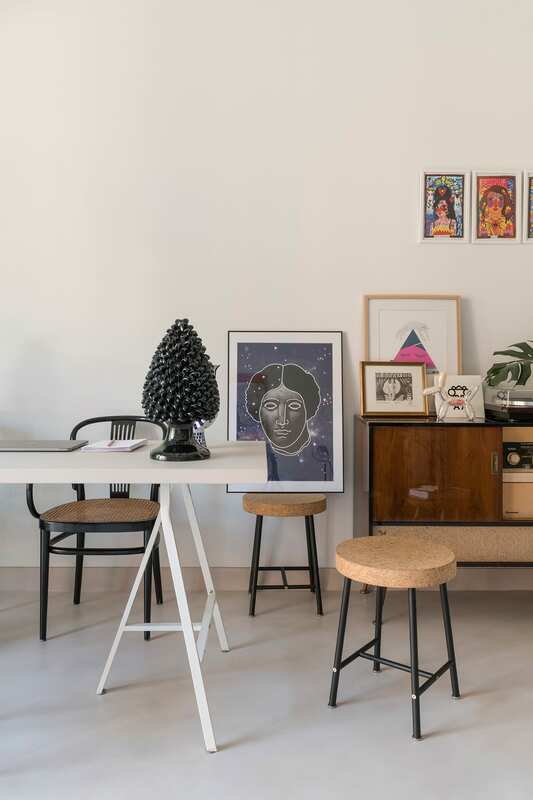 The gist of the brief was to transform the house into a ‘wunderkammer’, a German word used to describe a quiet retreat filled with emotionally charged possessions. 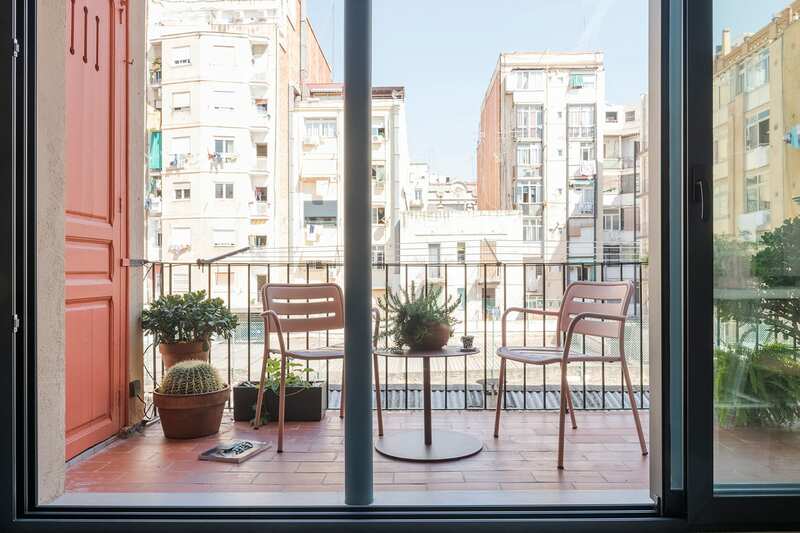 The 1914 building in Barcelona‘s Eixample district is a classic example of the Catalan Art Nouveau style. 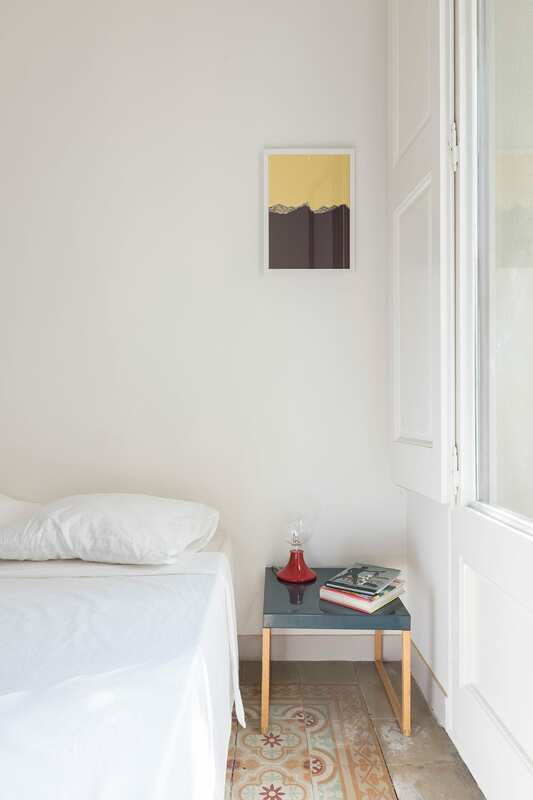 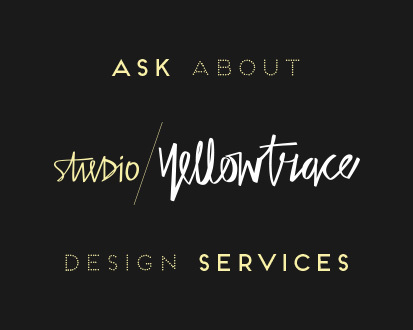 The apartment was bought in a state of neglect and needed some serious TLC. 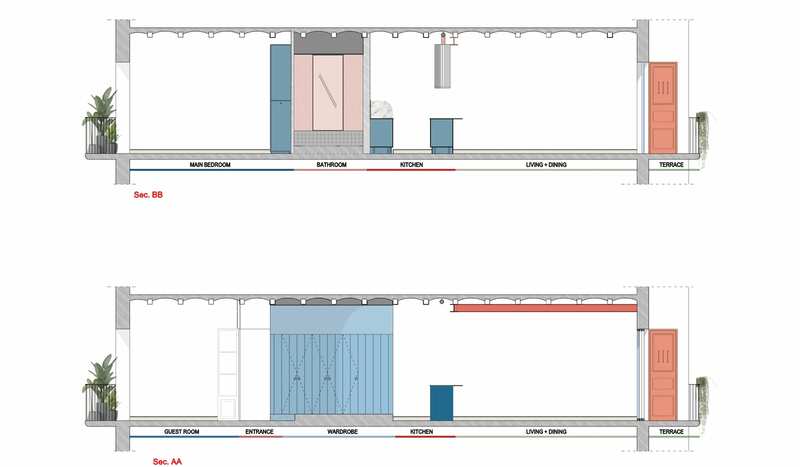 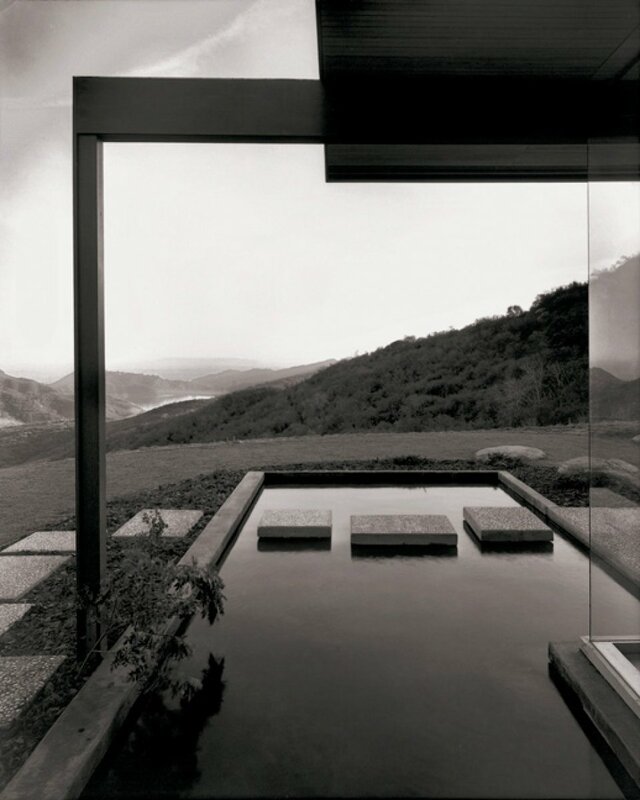 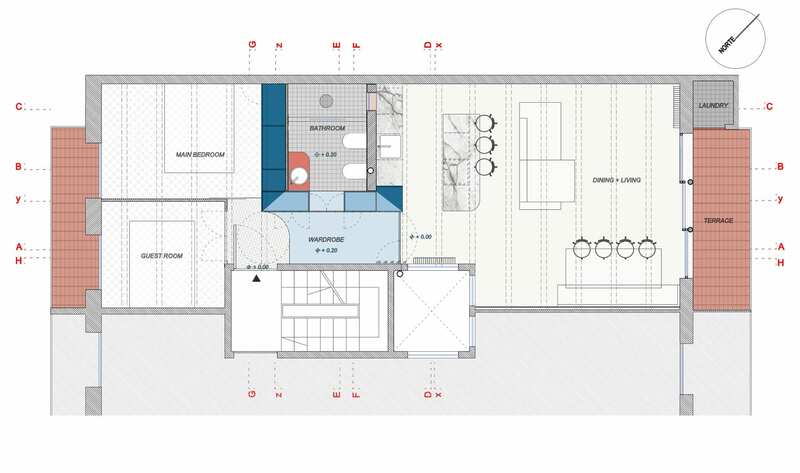 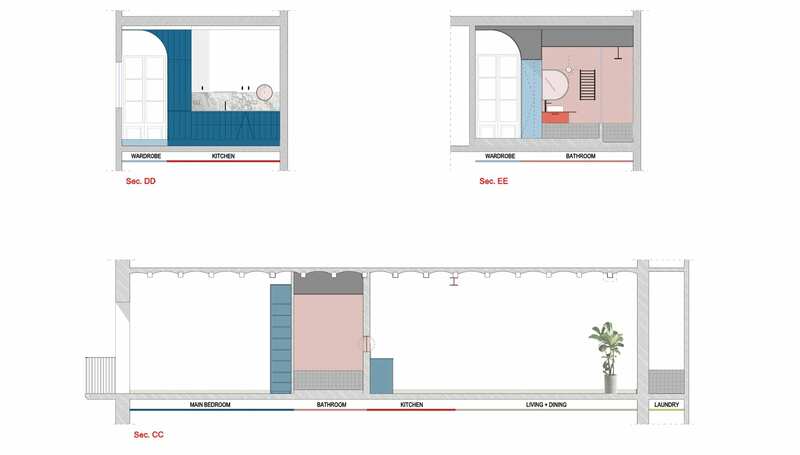 The original layout consisted of a series of partitions, dividing the 75 sqm space into six small rooms. 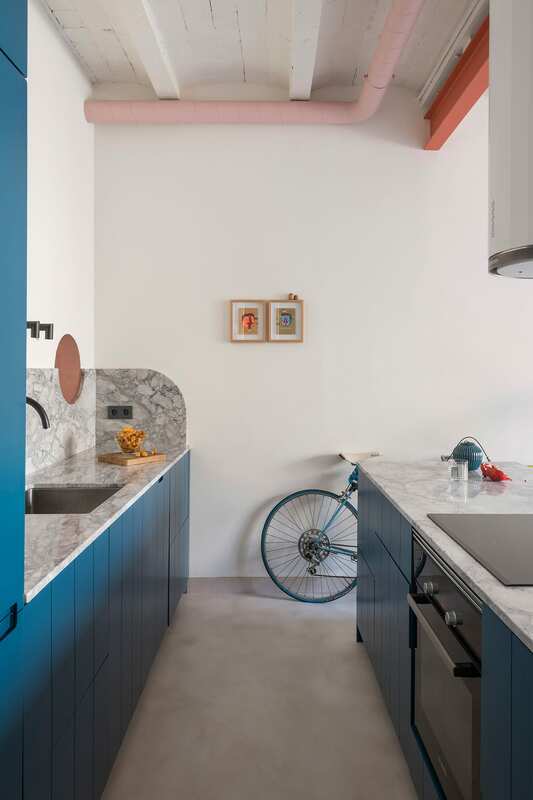 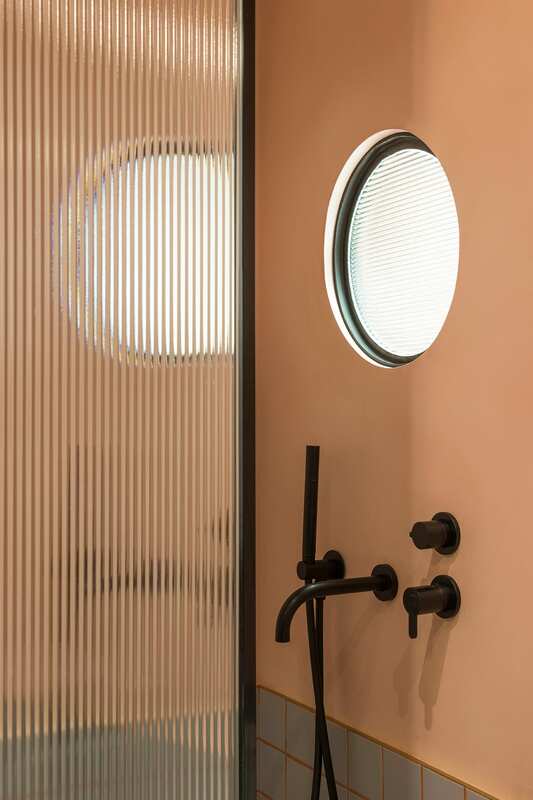 Serboli wanted to maintain as many of the pre-existing period elements as possible, while simultaneously creating a space with distinct contemporary character. 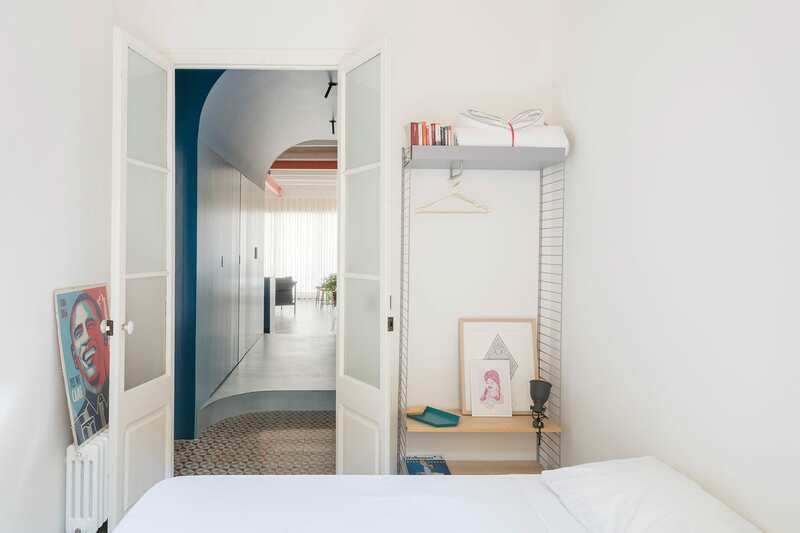 The original doors and tiled floors of the two bedrooms, adjacent to the entrance, could be preserved. 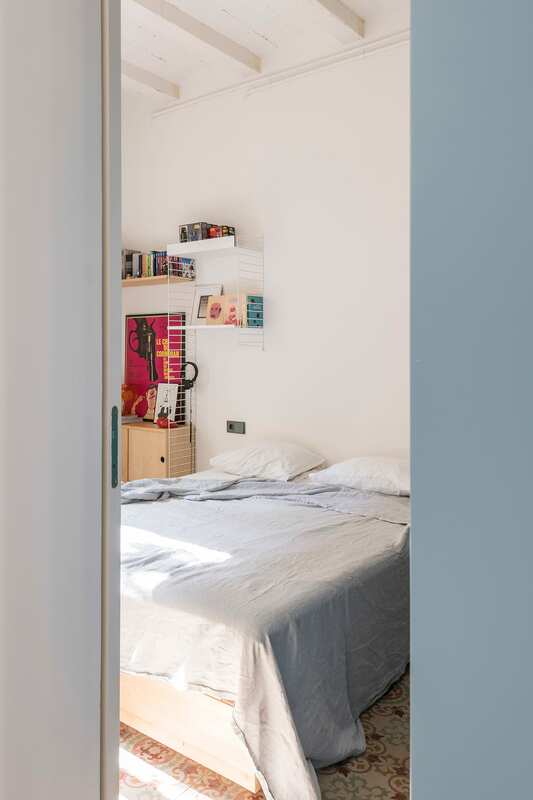 The remaining walls and floors had to be totally removed and redone, which Serboli took as an opportunity to completely re-design the interior layout. 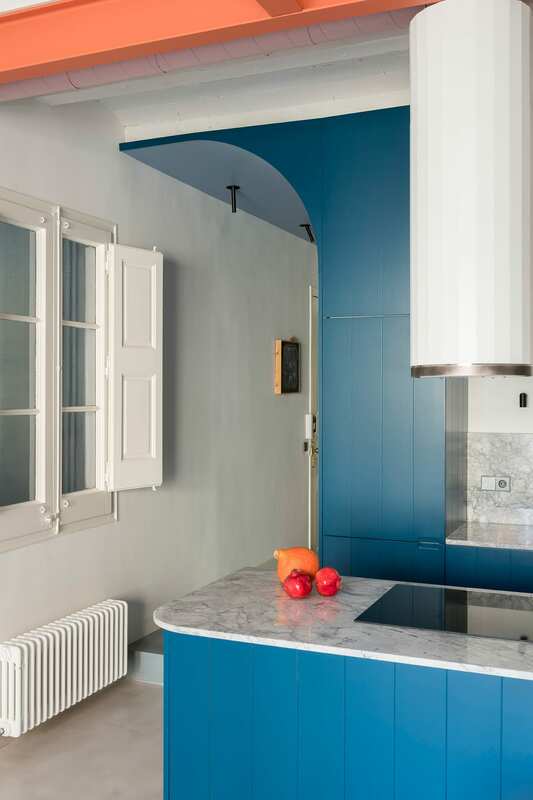 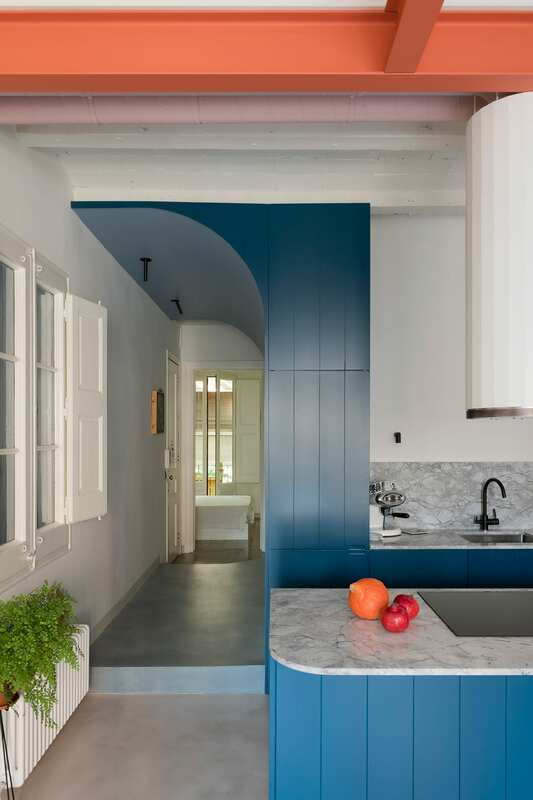 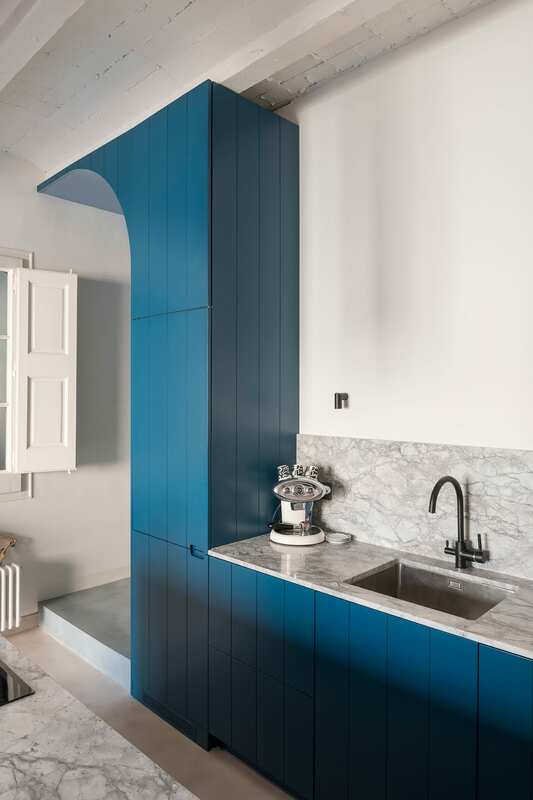 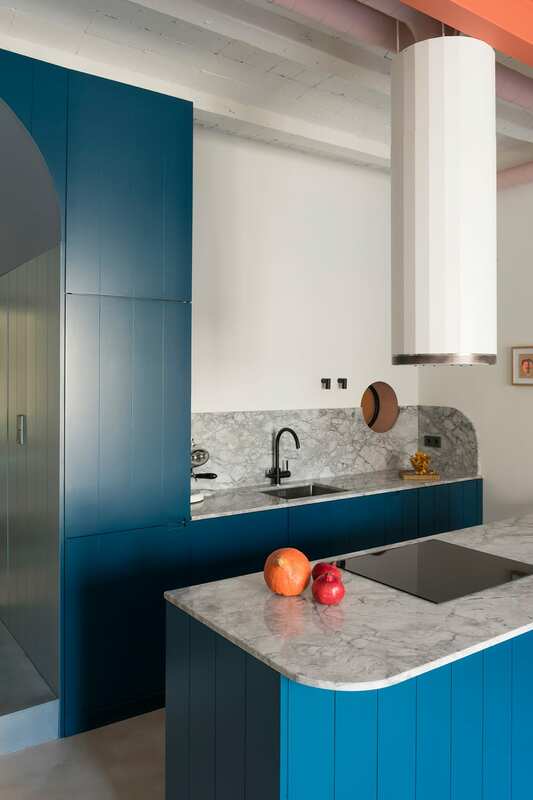 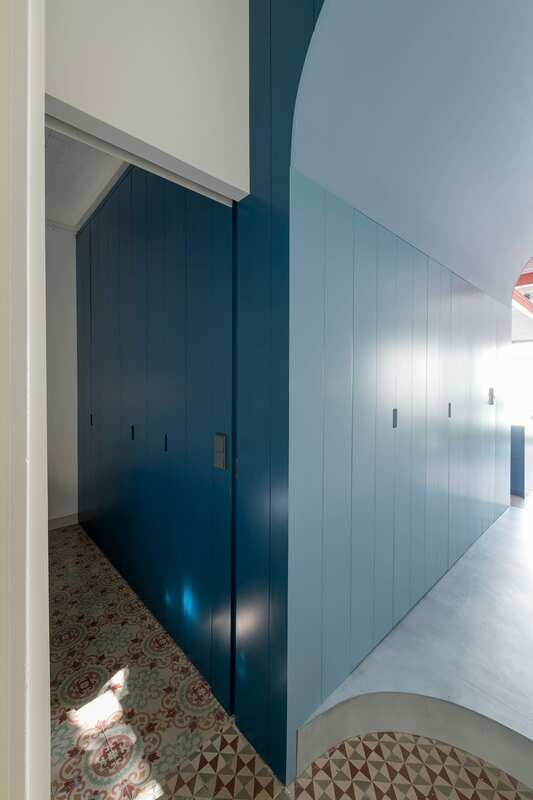 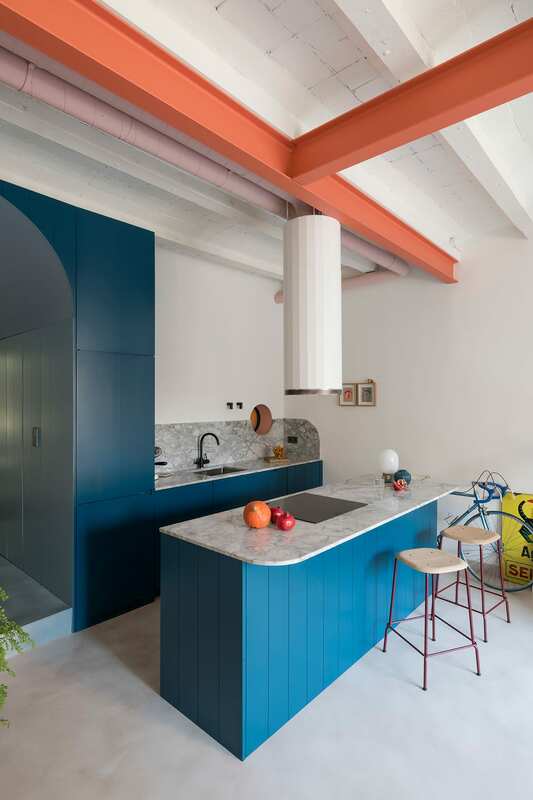 A blue lacquered, panelled timber box was inserted into the centre of the floor plan, defining the spaces around it. 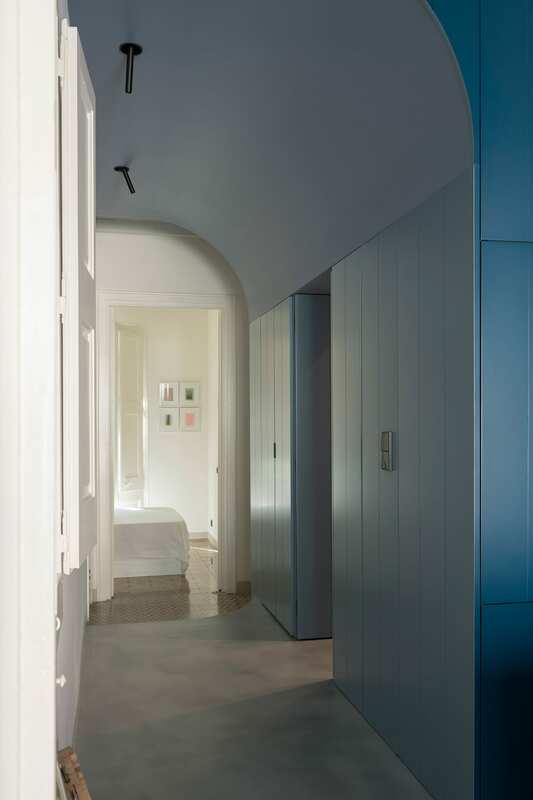 A corridor was carved out in a semi-arc, connecting the bedrooms to the rest of the living space. 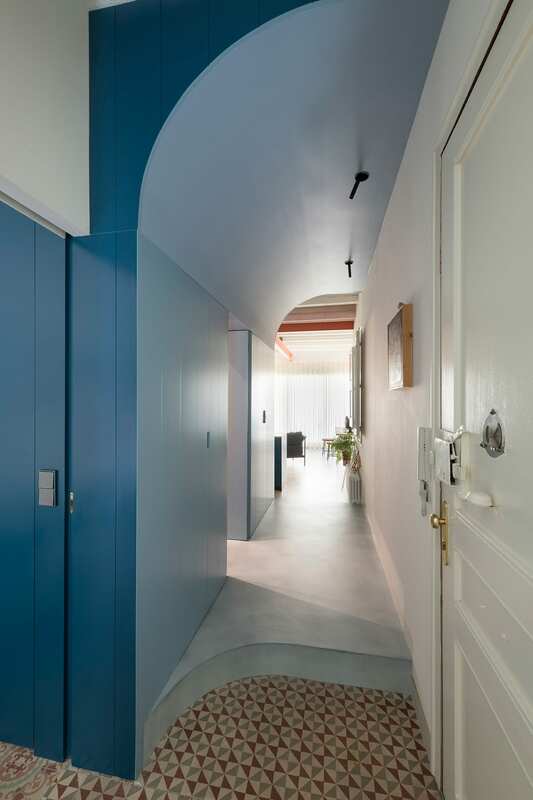 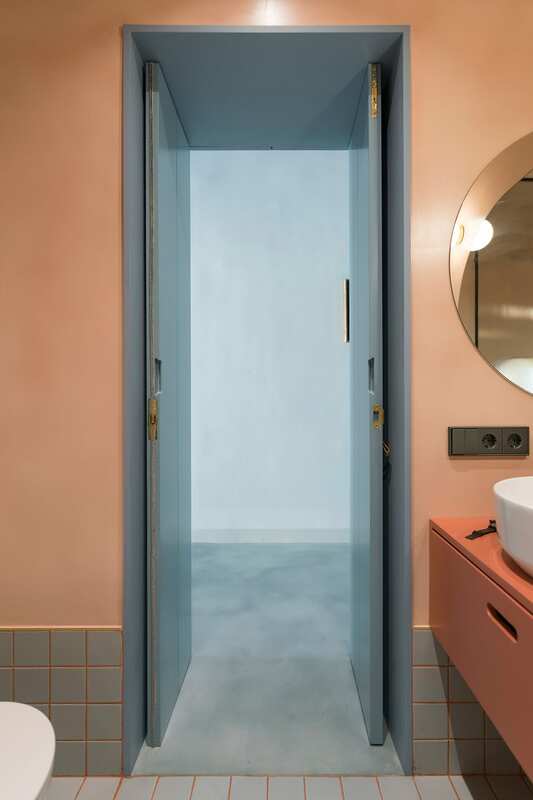 The corridor’s ceiling and floor are covered by light blue micro-cement, complementing the darker shade used for the box. 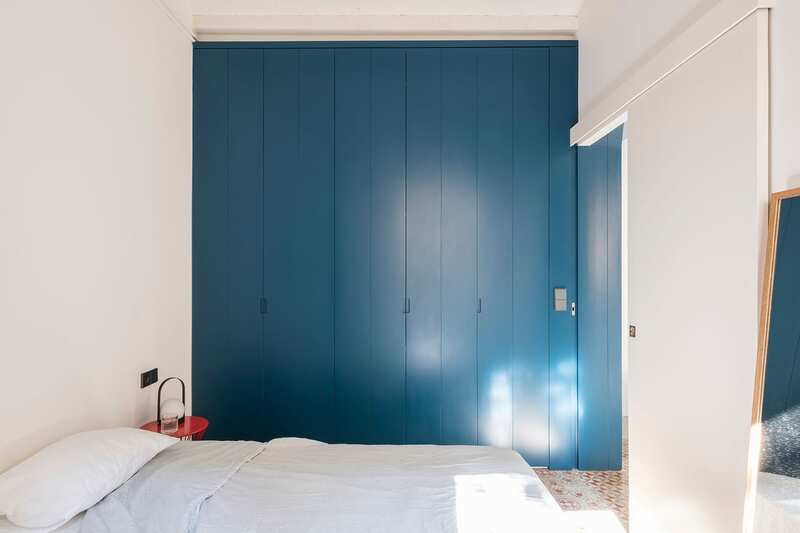 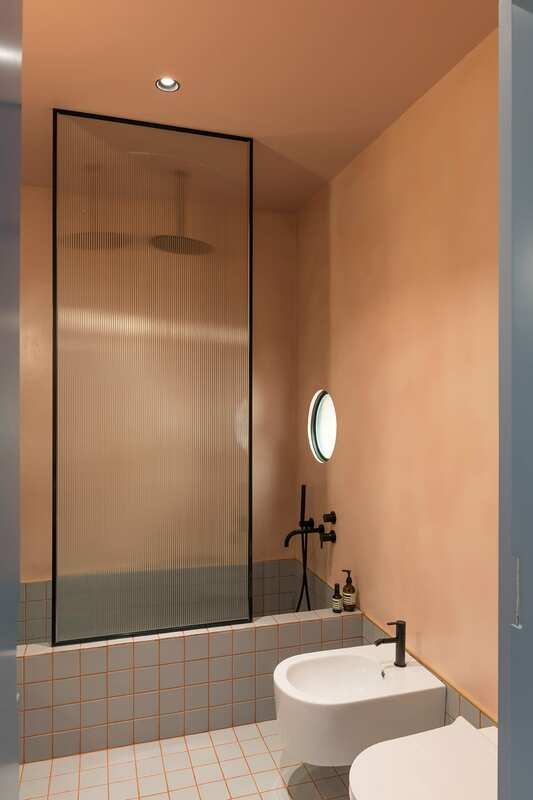 Built-in closets line the entire external façade of the box, camouflaging the entrance to the bathroom. 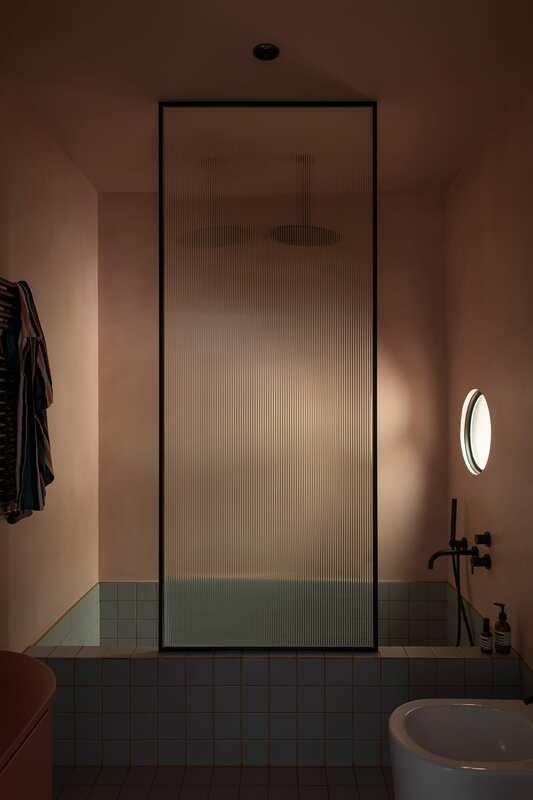 The bathroom, contained within the blue box, is a total sanctuary. 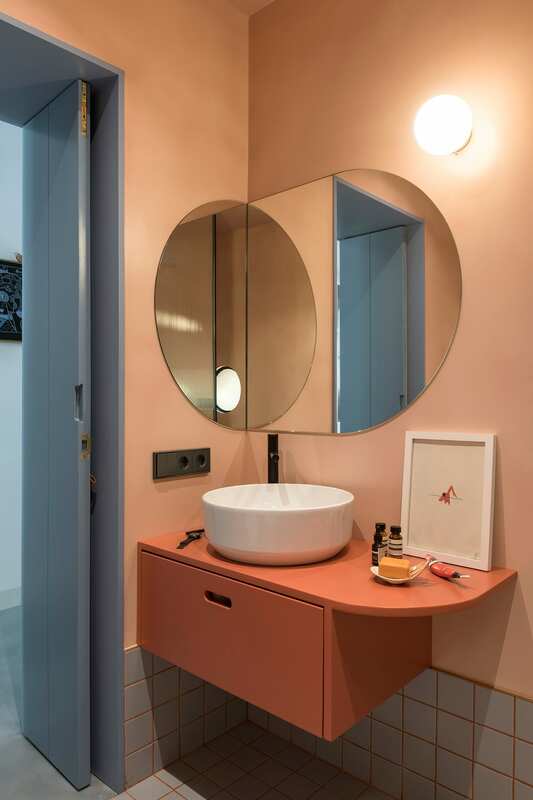 Micro-cement again covers the walls, this time in a warm shade of pink. 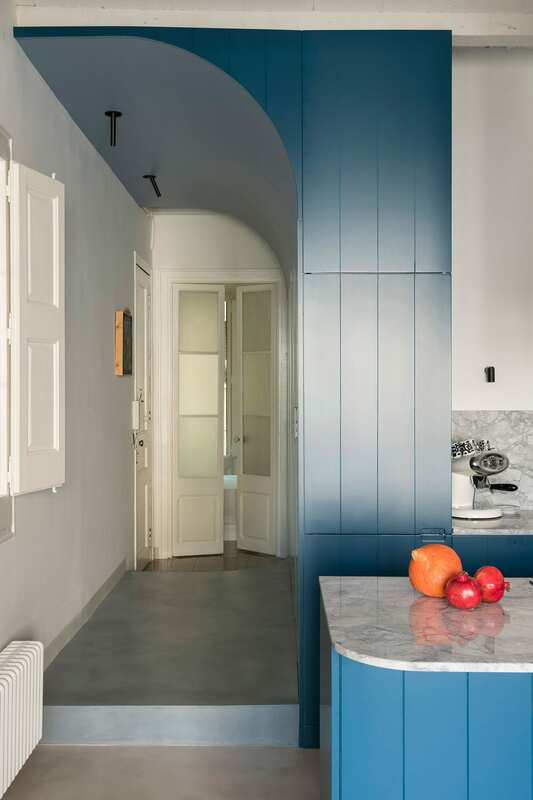 Custom features, such as a circular funnelled-glass window that peeks through to the kitchen, and a curved mirror that folds across two walls make the space feel special. 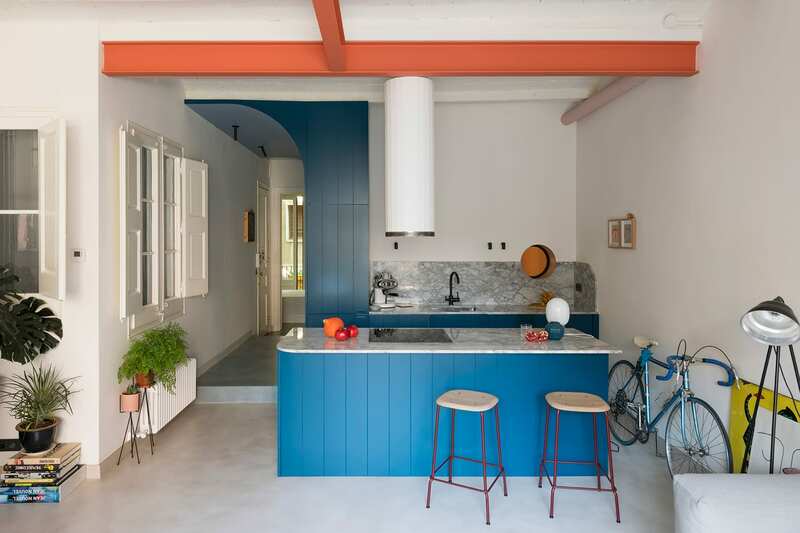 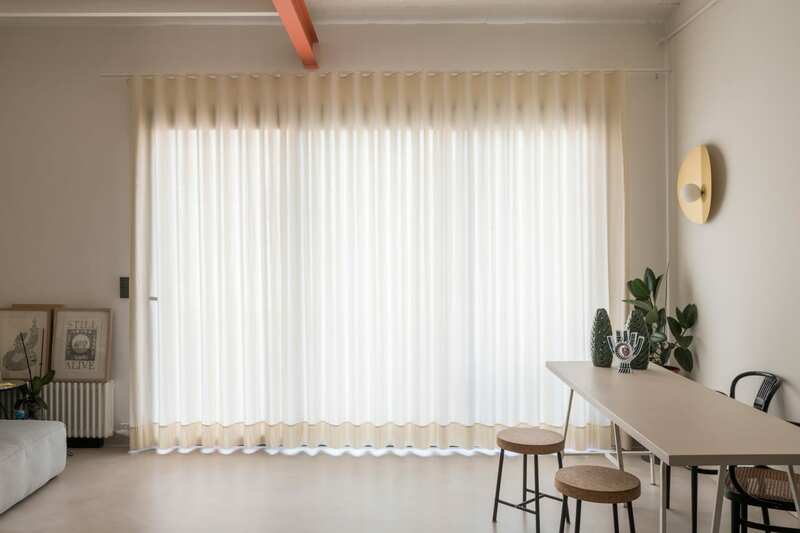 A wall-length French window that opens on to the terrace is the star of the open plan kitchen-living space, allowing for ample natural light. 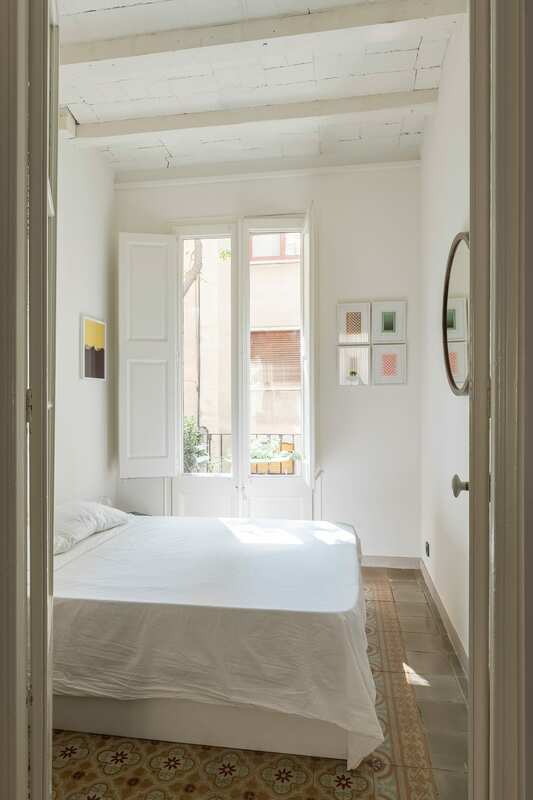 False ceilings were removed to expose original Catalan vaults, which were recovered and painted creamy white. 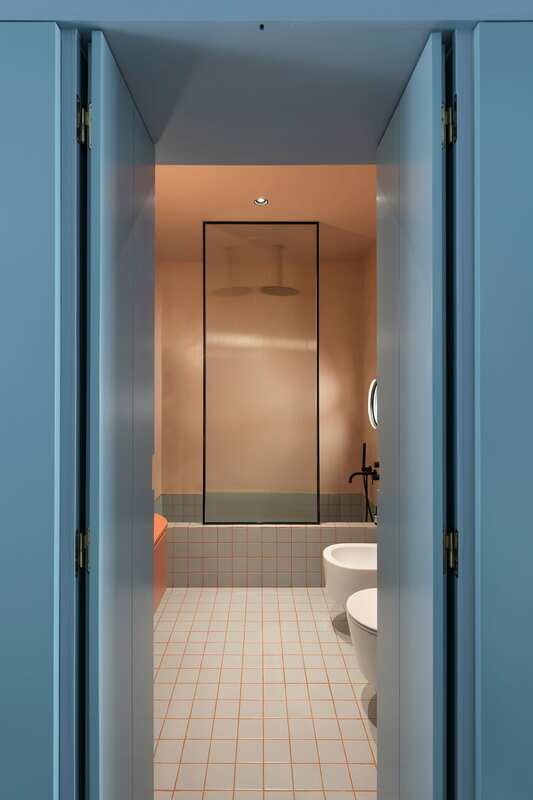 Coral beams do double duty, providing a contrasting visual to the blue box, and reinforcing the ancient partitions that once divided the space. 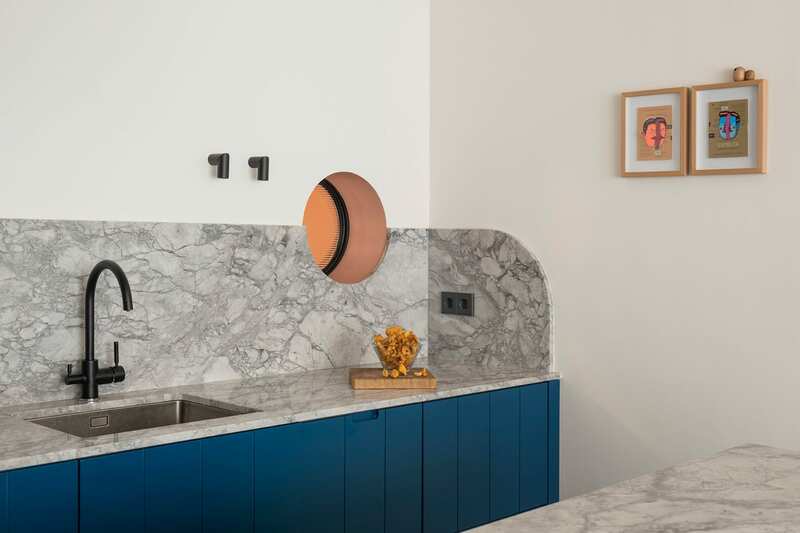 Brass-topped skirting boards, a Portobello marble splashback and countertop, and bespoke furniture add touches of luxury throughout the apartment. 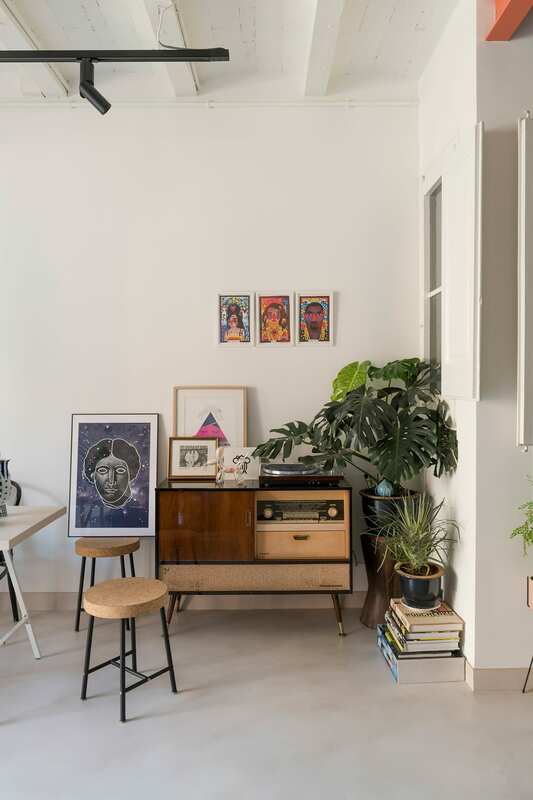 A wunderkammer indeed. 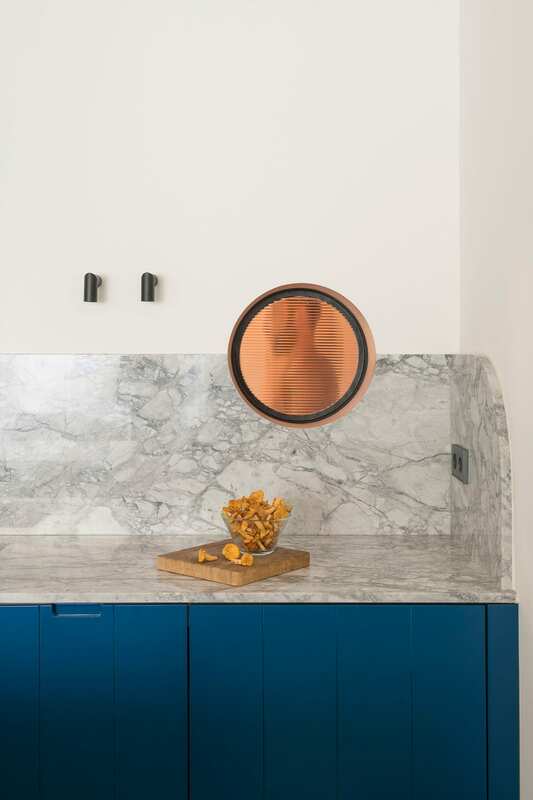 See more from Colombo and Serboli on Yellowtrace here.